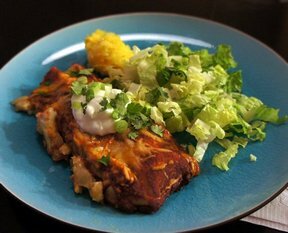 Terrific chicken enchiladas. The enchilada sauce and cream of chicken soup and the perfect topping to the rolled up tortillas stuffed with chicken, chilies and cheese. Preheat oven to 350 degrees F. Grease a 9x13" pan. 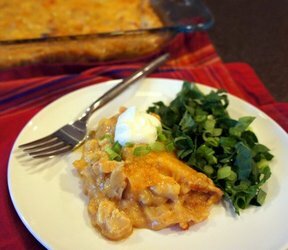 Combine chicken, sour cream, onion, grean chilies and 1 cup cheese. 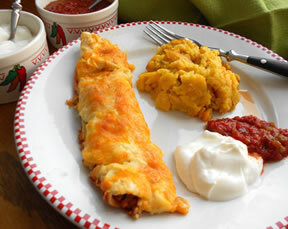 Fill each tortilla with a little bit of this mixture. Roll up and arrange seam side down in prepared pan. Combine chicken soup, water and remaining cheese. Pour this mixture on top of the tortillas in the pan. Top with lettuce, sour cream or any other desired toppings. "Great flavor. I made the mistake of making them in advance, so the bottoms got too mushy but I think if you baked them right away, that wouldn't be the case. I will do that next time."